Seat Belts on School Buses? A fatal bus crash in Chatanooga that killed six children has intensified the demand for seat belts on school buses. This dialogue is similar to the use of various Active Shooter programs after Sandy Hook. The dialogue is important, but decisions should be made rationally, not in response to the emotions of the tragedy. So what are the facts about school buses and fatal crashes? According to the National Highway and Transportation Safety Administration (NHTSA), since 1988 there have been over 416,000 fatal crashes in the United States. 1,265 of these involved school buses, or 0.03%. 1,409 people have died in accidents involving school buses, of which 113 were students (8%). 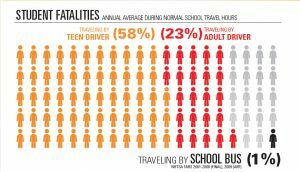 As is seen in the graphic below, 1% of students killed during normal school travel hours were on a school bus, making school buses the safest way to get to school (NHTSA, 2009). In any rational dialogue on a topic, it is good to consider the pros and cons. It can cost up to $15,000 to retrofit a school bus with seat belts, including the hardening of seat frames to be able to properly install lap & shoulder belts. Students can, and have, use the belt buckles as weapons. It would be next to impossible to ensure that all students remain properly buckled. After an accident, disoriented and panicked students may find it difficult to get out of their seat belts. The proper use of seat belts requires they be adjusted each time they are used. This will take additional time. The installation of seat belts will reduce bus capacity, requiring more buses be used to deliver the same number of students. Students who fail to use seat belts properly may be thrown into belted students, creating a double impact. As of yet, there are no federal standards to outline proper installation of seat belts in school buses. The safety of all children should be the goal of everyone who cares for them, so the ultimate goal is to have zero children killed while in our care. Therefore, fair consideration should be given to any idea that can improve child safety, including the use of seat belts on school buses. However, that means considering all the pros and cons. The ones above are just a start. Having passion for the care of children is a wonderful thing, but we need to take care to not let that passion cloud our decision-making. The stakes are too high. A 4th-grade South Carolina student was struck by a school bus while riding his bicycle on school property. The bus was pulling out of the bus loop by the school when it struck the young man. The student was wearing a helmet, and was responsive as of the date of the story. This story is an example of the dangers faced by schools every school day, especially with school bus traffic safety. School Transportation-Related Incidents are the leading cause of deaths in K12 schools. Active Shooter Incidents get a tremendous amount of press, with comments on them even being made by the President of the United States. Yet, according to a 2014 observational study on the various causes of fatalities in U.S. K12 schools, Active Shooter Incidents ranked fourth. The number one cause of fatalities? School Transportation related incidents. The study Relative Risks of Death in US K12 Schools reviewed various causes of fatalities in schools from 1998 to 2012, a 15 year period. 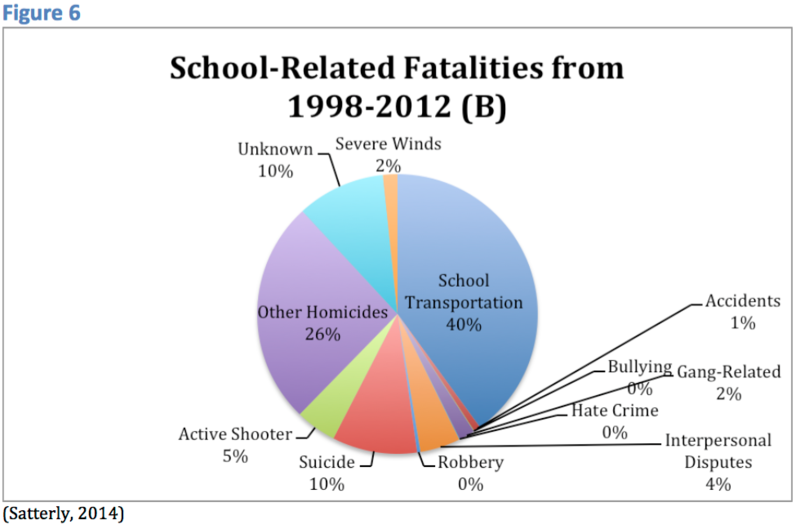 The top five known causes were, in order, School transportation-related incidents, school homicides, school suicides, Active Shooter Incidents, and interpersonal disputes. During that 15-year period, there were 525 school transportation-related fatalities, 489 school homicides, 129 school suicides, 62 fatalities in Active Shooter Incidents, and 49 deaths from interpersonal disputes. Are Schools Focusing on the Right Things? Based on these numbers, a student is just under nine times more likely to be hurt in a school transportation-related incident than an Active Shooter Incident. Keeping that in perspective, school transportation-related incidents account for less than one percent of all traffic accidents. All this data begs the question, what are schools doing to address school bus traffic safety? Student drop off and student pick up times are the most dangerous times a school faces, everyday. Has school administration developed a way to keep buses and parents separated, and those two separated from walkers and bike riders? Older schools often do not have these considerations in their designs, so it is up to the administration to develop suitable plans. Newer schools often have these areas separated, but it will still take human supervision for proper school bus traffic safety. Let’s spend some time preventing those things that are more likely to happen. On Tuesday, January 26, Susan Jordan was struck and killed by a school bus. The Principal of Amy Beverland Elementary School in Lawrence, IN, was supervising her students as they boarded buses at the end of the school day. The school bus reportedly jumped a curb, and Mrs. Jordan was pushing students out of the way when she was struck and killed. Two students were taken to the hospital with serious, but not life-threatening injuries. This information is still developing, so the the purpose here is NOT to be critical of anyone. After a traumatic incident such as this, it is very easy to act on our emotions. Terror Management Theory tells us that feelings of vulnerability are normal, as are our desires to change things so that we can avoid a similar trauma. Making this change should be done in a thoughtful, systematic manner. As always in emergency management, the first step is identifying risk. In the report, Relative Risks of Death in K-12 Schools, the number one cause of school-related fatalities was found to be school transportation-related incidents. Buses weigh around 33,000 pounds each, and drop off and pick up times has a large number of students and staff near these behemoths. A slight lapse of supervision or care can have tragic consequences. This chart compares various causes of fatalities. Note that school transportation-related fatalities make 40% of the total. Schools have developed procedures for getting kids off of, and onto their buses. These procedures were made for a reason, hopefully to meet a goal of student and staff safety. Therefore we do not want to change procedures related to school transportation based on the emotions of the moment. Experience tells us that such decisions often have unintended consequences. We need to make our decision-making deliberate and contemplative. That leaves you with the un-answered question, “What can I do?” One thing you can do is look for ‘mission creep’. ‘Mission creep’ is, “The gradual broadening of the original objectives of a mission or organization.” Each school has in place various procedures, each with their own goals. As time goes on, things happen which may alter those goals, or cause goals to be forgotten altogether. This is ‘mission creep’ in action. For example, a dismissal procedure may call for parents to park in a certain area to get their children, to keep them away from the buses. Over time, a parent may request to get closer for some particular reason, then another, then another, and before you know it, cars are interfering with bus traffic. So what can you do to combat mission creep? 1) Assess what you are currently doing. 2) Gather information. Without having all the information, it is hard to change what your doing, and know that you are doing the right thing. 3) Re-identify your goals, then assess whether you are meeting them or not. Has mission creep occurred? Take care of what you should be doing, then you can address whether you should be adding a level of complexity to the current procedure. 4) Identify whether what happened was a system failure, or a failure of application. b) Application failure requires training and practice to correct, but does not necessarily require a change in procedure. Has mission creep occurred in your procedures? If what you are doing is not meeting your original goals, plan on how to change them. Do so in a deliberate, thoughtful way. Reassure yourself, your staff, your parents and your students that you are doing the right thing. That can help allay their fears. Be wary of ‘knee-jerk’ responses leading to changes that have not been properly vetted. There is much at stake.